With the doors unlocked, pull handle 1. With the doors locked, press button 2 on handle 1 of one of the two front doors and pull towards you. 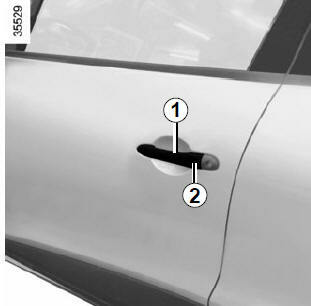 With the doors unlocked, pull handle 3. 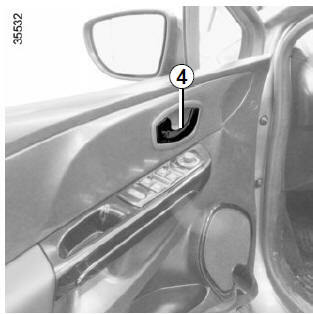 As a safety precaution, the doors should only be opened or closed when the vehicle is stationary. If you have switched off the ignition and left the lights switched on, a reminder buzzer will sound when a door is opened. When the driver’s door is opened a beep will sound if the card is left in the reader and the message “Remove card” will appear on the instrument panel. 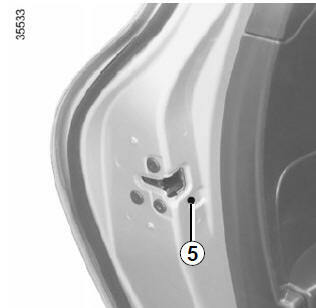 If a door (or boot) is open or not properly closed, as soon as the vehicle reaches a speed of approximately 6 mph (10 km/h), the message “boot open” or “door open” (depending on which is open) will appear on the instrument panel accompanied by a warning light. 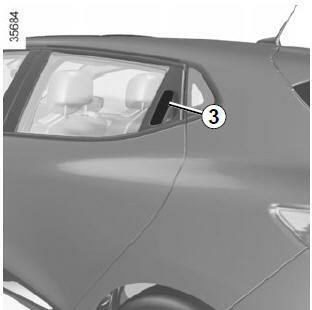 To make it impossible for the rear doors to be opened from the inside, move lever 5 on each door and check from the inside that the doors are securely locked. Driver’s responsibility when parking or stopping the vehicle Never leave an animal, child or adult who is not self-sufficient alone on your vehicle, even for a short time. They may pose a risk to themselves or to others by starting the engine, activating equipment such as the electric windows or locking the doors. Also, in hot and/or sunny weather, please remember that the temperature inside the passenger compartment increases very quickly.